Let me know if you found some problem or if you want to add some command. I know there is already some efforts into proving Git support, I don’t want to disturb there, this provides to many commands and is just a textual port. There is nice presentations of data from the Git plugin that can be used by this plugin, I’ll look there later. It should work with files names and messages in any language. Right click on “multiple/single” “files/folders” of the “tree” sidebar to apply commands on selected files which maybe are from different repositories. To apply commands to focused document use the buffer context menu. o git diff git diff HEAD -- "/selected/paths/files/or/and/folders"
o git diff git diff  -- "/selected/paths/files/or/and/folders"
o git diff git diff --staged -- "/selected/paths/files/or/and/folders"
o git diff git diff --cached -- "/selected/paths/files/or/and/folders"
o git diff git diff origin/master.. -- "/selected/paths/files/or/and/folders"
o git diff git diff ..origin/master -- "/selected/paths/files/or/and/folders"
o git diff "previousTag".."lastTag" -- "/selected/paths/files/or/and/folders"
o git log --stat --graph -- "/selected/paths/files/or/and/folders"
o git log -n 30 -p -- "/selected/paths/files/or/and/folders"
o git log -p -- "/selected/paths/files/or/and/folders"
o git log "lastTag"... --stat --graph --  "/selected/paths/files/or/and/folders"
o git log origin/master... --stat --graph -- "/selected/paths/files/or/and/folders"
o git log "prevToLastTag".."lastTag" --stat --graph -- "/selected/paths/files/or/and/folders"
o git tag -d "promptMessage"
o git checkout HEAD -- "/selected/paths/files/or/and/folders"
o git clean -f -d -- "/selected/paths/files/or/and/folders"
o git reset HEAD -- "/selected/paths/files/or/and/folders"
This is an awesome plugin Tito! Though, I really need to play with it to confirm that it works well, but I really like the side-bar integration and hope to use it as an example. I help admin the SublimeText org, and would like to see if I can push this to create a standard-ish framework for SCM integration. Thanks for the contribution! You welcome, this plugin uses the classes SideBarSelection, and SideBarItem originally created for “SideBar Enhancements” plugin. **SideBarGit ** class has method getSelectedRepos ( which should be moved to class SideBarSelection at some point) that given a list of paths it returns the paths of the git repos found on that list. I’m all in to use it as a framework to do anything related to files or directories “in the right way”, btw, still under testing and probably needs little tweaks. It would be nice if we can add these classes (SideBarSelection and SideBarItem ) to the “Default” package. Under OSX, some things work, some things don’t. Working manually through the command line works fine. After upgrading to latest version, can you tell if some command is not working? Just need new/delete branches etc. Are sidebar icons on the roadmap, or do those require core ST changes? Blamed lines can use markers. Or differences can use region markers? Can you please elaborate, with examples if possible, not sure what are you talking about, improvements welcome! I’m too lazy to write a basic example, but you can check out this. I don’t know what do you want to highlight. On a diff I may imagine character differences? on blame?? Where can I get this diff syntax file from? Oh The Oblivion theme doesn’t work with Diff. Better fix that! I’m using Cygwin’s git on windows. 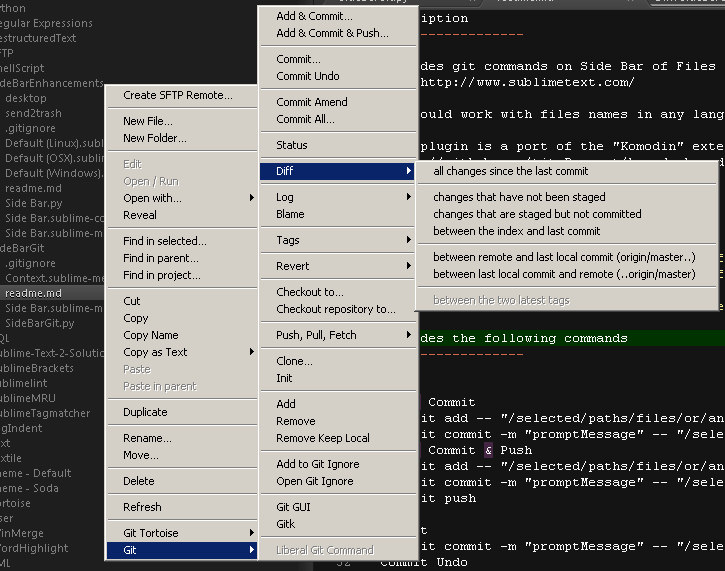 Other sublime git plugins work fine but this one shows this error when I try to run a command.